Should Riyadh and Abu Dhabi Fear Anti-Trump Lawmakers in DC? Since President Donald Trump won the 2016 presidential election, he has done much to strengthen the United States’ alliances with Saudi Arabia and the United Arab Emirates (UAE). 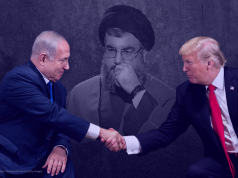 Yet in doing so, he has brought these two Gulf states into America’s domestic political arena which may well risk damaging both bilateral relationships with implications that could last far into the post-Trump future of US politics. Serious issues are beginning to arise concerning the findings and implications of the Mueller investigation. While President Donald Trump’s supporters will find plenty to disagree with, there is another area of the potential findings that may find unanimous condemnation. No longer exclusively focused on alleged Russian interference in America’s 2016 presidential election, the probe is also looking at Saudi Arabia and the United Arab Emirates (UAE) for their alleged ties with the Trump campaign and relations with figures in the president’s inner circle. In addition to these two Gulf Cooperation Council (GCC) states, there is another—Qatar, whose money trails and campaigns for influence in Washington have put the Qatar Investment Authority under scrutiny from Mueller, according to numerous media reports. Nader attended a meeting between Abu Dhabi’s Crown Prince Mohammed bin Zayed (MbZ), the UAE’s de facto ruler, and Trump’s son-in-law and advisor Jared Kushner. A key figure to watch is George Nader, an emissary from Abu Dhabi who cooperated with the investigation but may no longer be entitled to any leniency due to a possible violation of his plea deal. The Lebanese-American businessman played a pivotal role in setting up the controversial meeting between Erik Prince and Russian sovereign wealth fund head, Kirill Dmitriev. Nader attended a meeting between Abu Dhabi’s Crown Prince Mohammed bin Zayed (MbZ), the UAE’s de facto ruler, and Trump’s son-in-law and advisor Jared Kushner. He also gave $ 2.5 million from the UAE to U.S. lawmakers in order to push anti-Qatar legislation. The extent to which top UAE officials are unsettled by the investigation is remarkable. That MbZ has not returned to Washington since his visit to the Oval Office just before Trump departed on his first official trip to Riyadh in May 2017 is almost certainly tied to concerns about MbZ possibly being named publicly in the probe. There are other issues involving other senior leaders of the Emirati leadership who seem likely to be implicated. Consequently, because of the Mueller investigation, and other issues too, this year will probably be problematic for Riyadh and Abu Dhabi in Washington. With the House of Representatives of the 116th Congress now controlled by anti-Trump lawmakers who will use their investigative powers in an effort to unseat the American president in what is already a vicious and ugly time in American politics, Saudi Arabia and the UAE will face new challenges with the Democrats now in charge of the House of Representatives as they push ahead with their agenda against Trump. 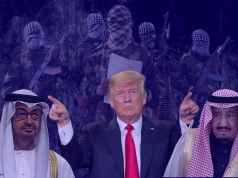 The murder of Jamal Khashoggi and the Yemen humanitarian disaster will be issues that Democratic lawmakers and presidential candidates highlight in their attacks on Trump’s Middle East policy, particularly regarding U.S.-Saudi relations. The murder of Jamal Khashoggi and the Yemen humanitarian disaster will be issues that Democratic lawmakers and presidential candidates highlight in their attacks on Trump’s Middle East policy, particularly regarding U.S.-Saudi relations. The detention of human/women’s rights activists in Saudi Arabia will probably receive condemnation from more lawmakers too if the Kingdom does not release these individuals soon. There’s also the case involving a Saudi national, Abdulrahman Sameer Noorah, who fled the U.S. under mysterious circumstances while in pre-trial detention and facing charges of first-degree manslaughter in Portland, Oregon. This could deepen the rift between the Trump administration and American lawmakers on the issue of Washington-Riyadh relations depending on the facts elicited during the investigation of the case. With the Mueller investigation results prompting pundits to forecast an impeachment of Trump—on top of the possibility of a Democratic hopeful defeating him in next year’s 2020 presidential election—Saudi Arabia and the UAE should be concerned about the post-Trump era. The strong bonds that both Saudi Arabia’s Crown Prince Mohammed bin Salman (MbS) and MbZ built with Trump undermined a traditional understanding that America’s alliances with the Gulf monarchies were to be unrelated to partisanship. Put simply, the risks of “becoming a partisan flashpoint in U.S. politics” never experienced before (including even during and after 9/11) will be a real test for Riyadh and Abu Dhabi which may find themselves suffering from sanctions sooner rather than later. American officials are already discussing such options. As the Democratic party’s legislators in the House now reflect the most diverse Congress in American history, with more minorities being represented after last year’s midterm elections, the Saudis and Emiratis should look to ways to improve their standing with different constituent groups in America beyond Evangelicals, whose delegations have received a welcome in Abu Dhabi from MbZ. Unquestionably, Saudi Arabia and the UAE maintaining close ties with domestic groups in the U.S. will be important for Riyadh and Abu Dhabi’s relations with Washington after Trump leaves the Oval Office. Yet, Saudi and Emirati media outlets have recently attacked the House of Representatives’ two newly-elected Muslim-Americans—Rashida Tlaib (D-MI) and Omar Ilhan (D-MN). Articles against these two politicians published by Gulf-based outlets allege that Tlaib and Ilhan maintain ties to international terror groups and work on behalf of a global Muslim Brotherhood-orchestrated campaign to remove Trump from power. It is doubtful that such language can help the Saudi and Emirati leaders build new bridges with Democrats, nor with their constituents, who might be even more empowered after next year’s election, especially as their party places greater emphasis on pride in racial, ethnic, and religious diversity. This posture contrasts mightily with Trump’s “nationalist,” Islamophobic, and xenophobic narratives that Saudi Arabia and the UAE have at times somewhat supported, underscored by their response to the “Muslim ban” as well as the Saudi/Emirati media reports on Tlaib and Ilhan. During the eight years of the Obama presidency, which left Saudi Arabia and the UAE perceiving that the U.S. had abandoned them in favor of a rapprochement with Iran, Riyadh and Abu Dhabi were extremely frustrated with the leadership in Washington. 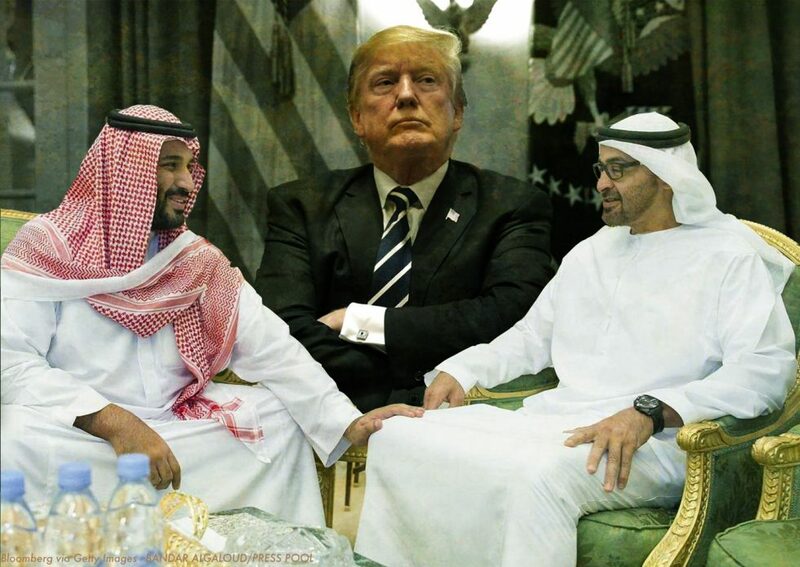 Yet looking ahead, it is possible that Washington’s strategic alliances with both Riyadh and Abu Dhabi could suffer as a result of how Trump has worked with MbS and MbZ to create a different type of personality-driven relationship, resulting in the Emiratis taking advantage of their friendship with Trump to further infiltrate the White House, perhaps equal to or more than the Russians have done so. Both MbS and MbZ may need to consider how to reverse the negative effects resulting from investing too much in Trump and essentially betting the farm on him. There is a storm coming that will likely see sanction efforts against Saudi Arabia and Abu Dhabi’s Crown Princes and others around them that may last years. There is a storm coming that will likely see sanction efforts against Saudi Arabia and Abu Dhabi’s Crown Princes and others around them that may last years. It would be negligent not to be thinking about such an outcome given the plethora of data available in open media. In the future, King Mohammed bin Salman must inevitably contend with Trump’s successor, whoever that may be. How will Saudi Arabia’s relationship with Washington look if more Democrats who are staunchly anti-Trump control both the executive and legislative branches of the U.S. government? In a day and age in which both Riyadh and Abu Dhabi have become quite pro-Republican, pro-Trump, anti-Obama, and, by extension, anti-Democrat, the potential for political change in America—as well as developments in the Mueller investigation—to have a heavy impact on Saudi Arabia and the UAE’s fundamental interests is real.